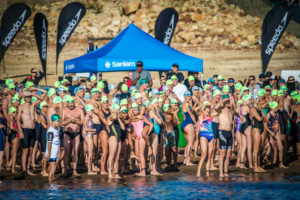 The Western Cape’s most exhilarating open water swim, the Sanlam Cape Mile brought to you by Sanlam Investments takes place annually at the Grabouw Country Club’s Eikenhof Dam and boasts two exciting distances: a 1 mile (1.6km) and a refreshing 500m swim. Exciting categories that can be entered include: 1 x mile, 5 x mile, 500m or a 500m team relay (consisting of a 4 member team with each team member swimming 500m). 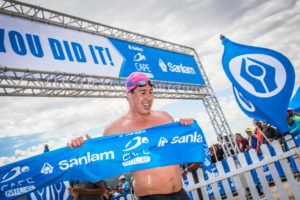 The inaugural Sanlam Cape Mile was held in 2015 and was a resounding success with the event growing from strength to strength each year. We look forward to welcoming all swimmers to the water’s edge of the Eikenhof Dam for a memorable swimming experience like no other. You can now also swim for charity! Lets the funds roll in! Entries Close: 10 February 2019 at midnight. 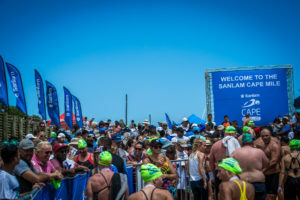 At the 2019 Sanlam Cape Mile we aim to be water wise and limit the use and wastage of water at the event and have put the following in place. Each entrant, spectator and support staff will have to bring their own water bottles filled with water. No free running water will be available at the venue to fill up water bottles. The Sanlam Cape Mile, Grabouw is hosted outside of the city on privately owned land. 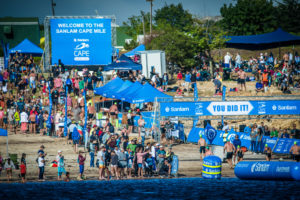 Sanlam Cape Mile makes use of Sale’s Hire as our service provider for portable toilets. All water used in the toilets is grey water and will be disposed of in a responsible manner by the service provider. Waterless hand sanitisers will be available for all to use at race-pack collection. 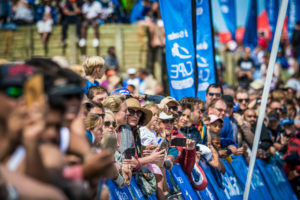 In 2018 this exciting category was introduced to the Sanlam Cape Mile. A team of four people can enter the relay category. We encourage families, friends, schools, clubs and corporate teams to enter. The relay consist of a team of 4 swimmers each swimming a lap of 500m. 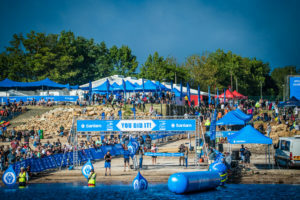 The start and finish area points of the relay will take place at the race village finish area on the left hand side of the dam. (Out and back swim). Dependant on the dam water levels (to be determined closer to the time) there are two possible routes; a single lap route, and a two lap route. 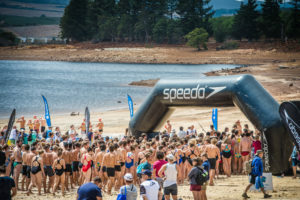 The start will be located on the right hand side of the Grabouw Country Club on the Eikenhof Dam. Four buoys will demarcate the route which is set to finish on the left hand side of the Grabouw Country Club. The course will be supported by canoeists with medical staff at hand. 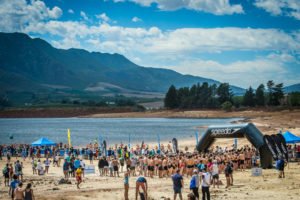 The start and finish areas are in the same location, to the left hand side of the Grabouw Country Club on the Eikenhof Dam. Four to five buoys will demarcate the route, which will be supported by canoeists with medical staff at hand. 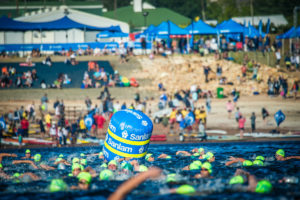 Do you have what it takes to swim the Sanlam Cape Mile five times? Enter the 5 x Mile Swim and prove to yourself that you are capable of taking on the challenge! 5 x Mile swimmers will receive a unique cap.